Riveted Steel Shelving Offers Sturdy Storage Space For Your Heavy Supplies. Shelving Unit Includes Five Shelves And Holds A Total Capacity Of 3,800 Lb. Of Evenly Distributed Weight With Its Heavy-Duty, Riveted Steel Construction. Each 3/8" Thick Shelf Is Made Of Treated Particleboard That Is Fully Compliant With The California Carb Act Of 2011. Boltless Design Assembles With Rubber Mallet In Less Than 30 Minutes. Shelving Assembles Vertically Or Horizontally To Fit Most Any Space. 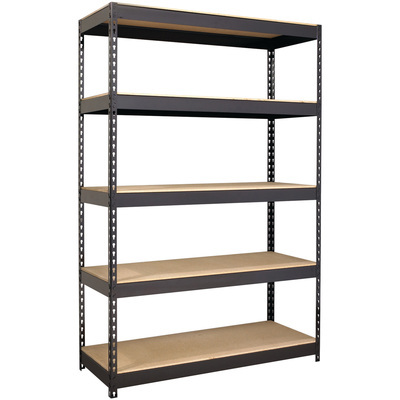 Sleek Black Styling Features Riveted Shelf Attachments And A Smooth, Powder-Coat Finish That Is Rust-Resistant..
Riveted Steel Shelving Offers Sturdy Storage Space For Your Heavy Supplies. Shelving Unit Includes Five Shelves And Holds A Total Capacity Of 3,800 Lb. Of Evenly Distributed Weight With Its Heavy-Duty, Riveted Steel Construction. Each 3/8" Thick Shelf Is Made Of Treated Particleboard That Is Fully Compliant With The California Carb Act Of 2011. Boltless Design Assembles With Rubber Mallet In Less Than 30 Minutes. Shelving Assembles Vertically Or Horizontally To Fit Most Any Space. Sleek Black Styling Features Riveted Shelf Attachments And A Smooth, Powder-Coat Finish That Is Rust-Resistant.